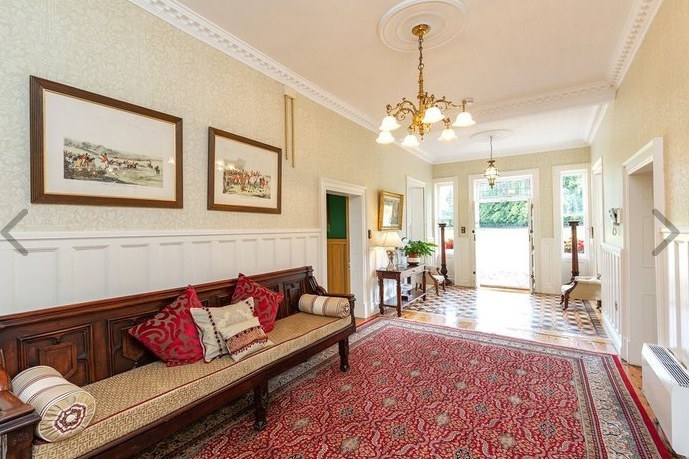 An impressive period property located on the banks of the river Clodagh outside Thurles has entered the market for €850,000. Moyaliffe House, once home to the Armstrong family, began construction in 1810 on the site of an historic towerhouse. The Armstrongs, who were of Scottish origin, were said to have derived their name during the Battle of the Standard (1138), when a warrior of the clan lifted a fallen king back onto his horse by using just one arm. In 1695, Thomas Armstrong (the youngest son of Captain William Armstrong of nearby Farney Castle) purchased the townland and the ruins of the towerhouse which had been built there by the Butler family in the early fourteenth century. When Armstrong purchased Moyaliffe (formerly Mealiffe), it was apparently just a small stone house built close to the foot of the old moate which still had the remnants of the tumbled castle on top. While under the ownership of the Armstrong family, the property was continually added to over the years, first through the addition of a Georgian wing by William ‘Billy’ Carew Armstrong (1752-1839) who served as rector of Moyaliffe from 1789 to 1797. A Victorian façade which characterises the house today was added by Captain James Wood Armstrong after he took control of the estate in 1864. The estate remained within the Armstrong family until 1999 when it was purchased by John and Breda Stakelum who spent the next number of years carefully restoring the property back to its former glory. Today Moyaliffe House has been extensively restored, comprising a modern family home that still retains many of its original features including a minstrels balcony for entertaining and a secret passageway. The property contains approximately 9,304sq.ft of living accommodation including six bedrooms, three of which are en-suite, and there is also a large and sunny library with its own balcony. A bright and spacious entrance hallway with a tiled floor is flanked by a morning room and formal dining room, which lead on to an inner hallway, large drawing room, study and wine cellar. Wood panelling, solid wood floors, shuttered sash windows, open fires, stained glass work and generous excellent proportions add up to create an atmosphere of easy elegance, and comfortable living. Moyaliffe House is picturesquely sited within a mature garden, beside a river, and within the grounds of a ruined castle. Its modest garden front conceals the several distinct extensions to the rear, forming enclosed courtyards. 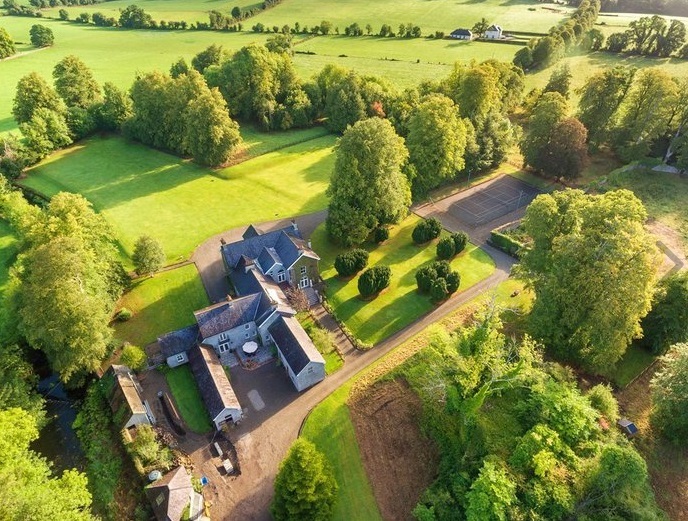 The 12 acres of grounds at Moyaliffe include landscaped gardens with mature trees, a paddock, and a beech walk along the banks of the River Clodagh, which runs through the property. In the grounds you can also discern the original site of the castle that gave the property its name. These extensive grounds give exceptional peace and privacy, while also offering many leisure amenities, including walks, and a hard tennis court. There is also a coach house in a separate stable yard. 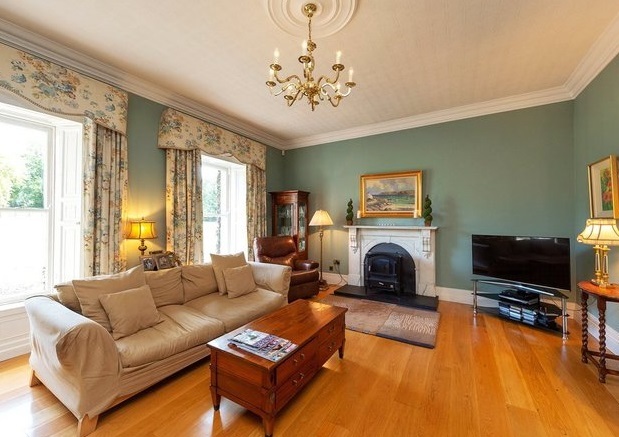 Price: €850,000 through joint agents Sherry FitzGerald Country Homes and Sherry FitzGerald Gleeson. For Sale by Private Treaty.